When you first get on the streets of Valencia during Las Fallas, you will be confused. All those people in stunning dress, what is happening? Are you missing a big show or event somewhere? Is this where they are all going? Where is it? No, that's just what they wear for the duration of Las Fallas festival. And at any slightest opportunity throughout the rest of the year. That's what they walk around in during fiestas. 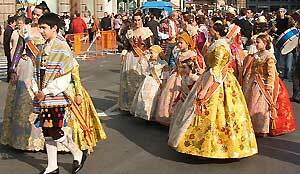 As mentioned before, the Fallas are about celebrating the Valencian traditions. The Valencians proudly put on their traditional costumes at the first opportunity and don't take them off for as long as they can. Here, it is still very cool to wear them. So the dressed up people you see around duirng Las Fallas are not rushing somewhere special. They are just taking a walk, proudly stating: "I am from Valencia and I am a member of Such-and-Such falla". You will see the costumes randomly on the streets, and in numerous pasacalles (parade of a falla through its neighbourhood). But the biggest two spectacles are the Awards to Ninots Infantiles and, especially, the Offering of the Flowers.